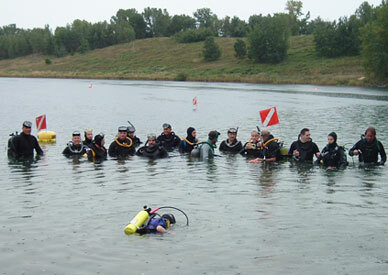 A portion of the group in attendance at the 4th Annual Vintage Dive Assembly at Lake Wazee, August 2007. A special guest at Wazee this year was Mike "Nelson" Follett. 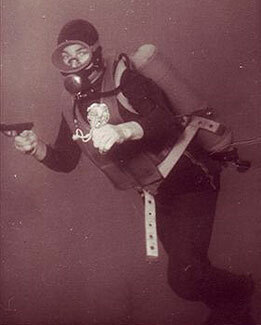 Mike wore authentic vintage gear similar to that used by Lloyd Bridges in the Sea Hunt TV series. 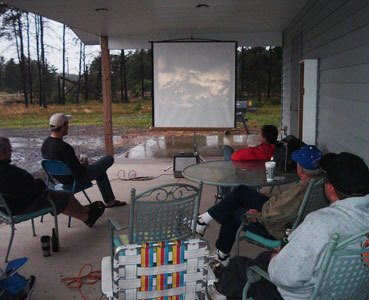 The group at Wazee enjoys old Sea Hunt episodes on 16mm film. 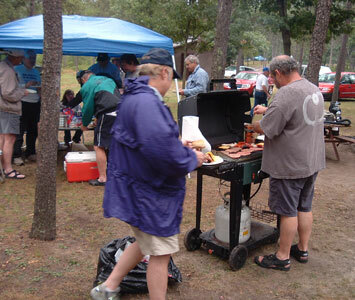 One of the highlights at Wazee every year is the tasty BBQ, thanks to master BBQ chef Dave Krafft. 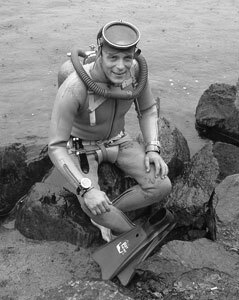 Mike "Nelson" Follett in authentic Sea Hunt gear, and even more authentic looking in a black and white pic! 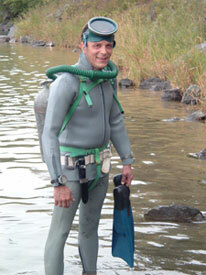 Galvanized tank, gray wet suit, green hoses, and look at that rare mask! Thanks to Jerry Lang and Frans Carlson for loaning some of the gear. This picture was taken at Australia's first diving school. 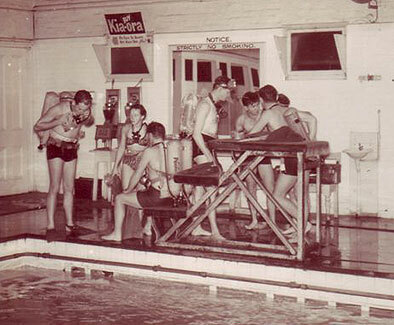 It shows the students getting ready for a pool session. They all have Porpoise rigs on. (1954) Photo courtesy of Stephen Taylor. 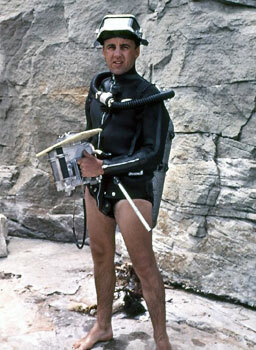 Australian divers were the first to use single hose regs. Brian Sellars is making a back entry with his Porpoise CA1, Melbourne 1954. Photo courtesy of Stephen Taylor. 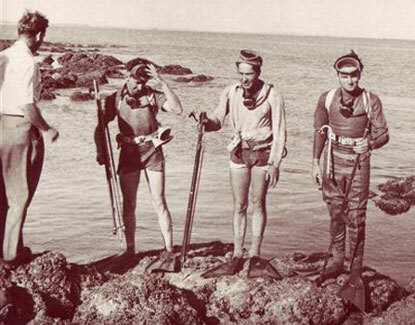 Early Australian divers using Porpoise scuba in 1954, before wet suits were available. Notice the loaded 'Bazooka' spear guns and old sweaters for warmth. Photo courtesy of Stephen Taylor. 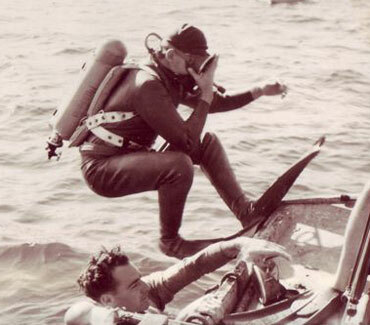 Australian diver Brian Sellars spear fishing in 1955. 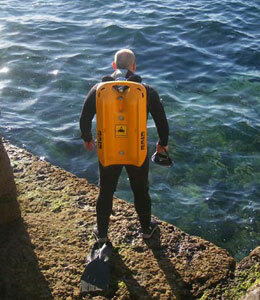 His Porpoise tank was designed to be worn inverted so he could reach the reserve. Photo courtesy of Stephen Taylor. 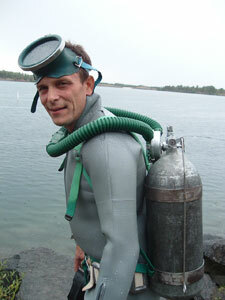 Sammy Crawford of Decatur, AL poses with his US Divers Jet Air two hose regulator (recently rebuilt by VSS). Zale Parry dives with Jerry Lang at Portage Quarry. 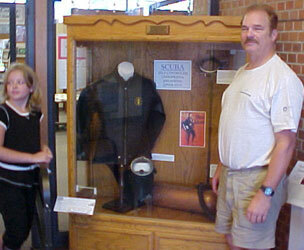 Jerry Lang, alongside a vintage scuba display at the Anoka Historical Society in Anoka, Minnesota. 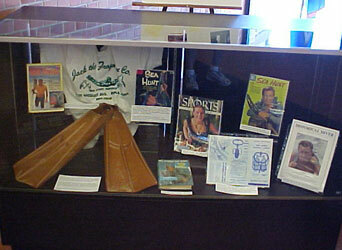 The display consists of vintage scuba items from the 50's and 60's. It runs through the end of August 2007. 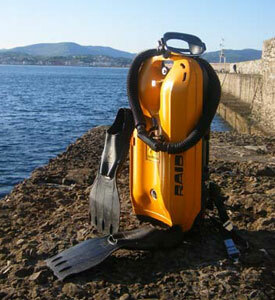 Dani's other gear consists of a Royal Mistral regulator, an Aquarama mask, and Spirotechnique fins. 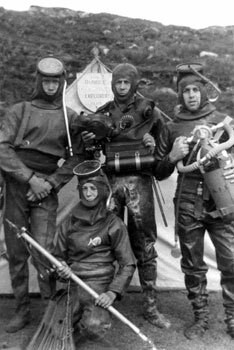 Bill Hall in Siebe Gorman dry suit, Alec Black with Heinke dry suit and ex-Navy rebreather, Walt Deas with Heinke dry suit and Seibe Gorman Aqualung, and David Dye in Dunlop dry suit. Photo taken at Ardmair Bay, west cost of Scotland, 1956 by Jean Deas. Walt Deas at Clovelly, Sydney, New South Wales, Australia, 1961. 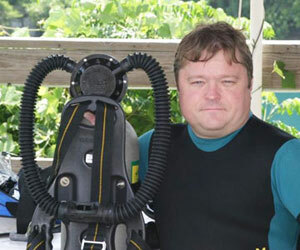 Walt uses a Healthways Scuba regulator, Healthways wetsuit, and US Divers mask. He is holding a Jordan Klein Mako housing with Eumig 8mm movie camera. He ended up working for Jordan in Miami, Florida in 1963. 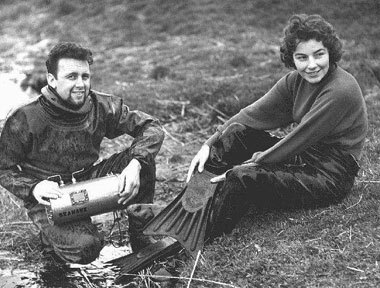 Walt (with Seibe Gorman dry suit) and Jean Deas (with Heinke dry suit and Typhoon fins) at Rescobie Loch, Angus, Scotland, 1956. Walt is holding a 16mm Kodak camera in 'home built' housing with gas fitting used for controls. 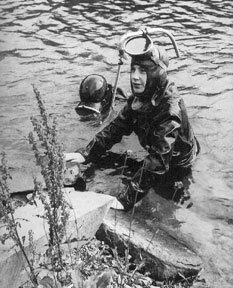 Jean Deas (in Heinke dry suit) and David Dye, snorkeling at Ardmair Bay, Scotland, 1956.